For casual read­ing, global search­ing and best read­ing expe­ri­ence on your com­puter click the “Online Edi­tion” link above. To per­form a global search click on the Search tab and enter a word or small phrase in search area. Results will be shown by vol­ume. Click on desired vol­ume, then click on appro­pri­ate page and wait for appro­pri­ate page to load for viewing. For a per­ma­nent file on your com­puter click on the year and vol­ume pdf link above to down­load pdf file and save in desired loca­tion on your computer. PLEASE NOTE: Files size may be large — allow a minute or two of down­load time. To search each PDF, hold Command / Con­trol and F keys down together for search func­tion on Win­dows sys­tems and Com­mand and F keys on Mac systems. For a per­ma­nent ereader file or view­ing on a mobile device (smart phone/tablet): Down­load the free Phi Delta Scroll Archive APP from App Store (Apple) or Android Mar­ket (Android) and then down­load desired volumes. 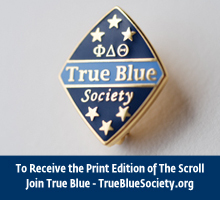 For a per­ma­nent pdf on smart phone/tablet: Visit www.phideltscrollarchive.com from your device and down­load pdf file. ANDROID and other devices – Save in default My Library or other pdf APP. FINAL NOTE: Vari­ances in down­load­ing, view­ing and sav­ing files may occur because of dif­fer­ences in browsers, oper­at­ing systems/levels, and smart phone/tablet manufacturers. Click here to read more about how to view our archives.